An entry-level piece of gear, well put together and a good place to start. A smooth, quiet action with adjustable beater angle. The felt beater might sound 'naff' to some. 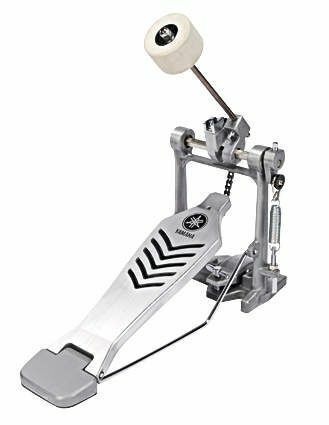 Yamaha's entry-level pedal is not big on features but, like all Yamaha hardware, it is beautifully put together and has an air of reliability about it. Lightweight design means that the pedal is seriously portable. Its chain drive delivers a suitably smooth, quiet action and the beater angle is adjustable. The supplied symmetrical felt beater is somewhere between school music room naff and retro chic, depending on your viewpoint.